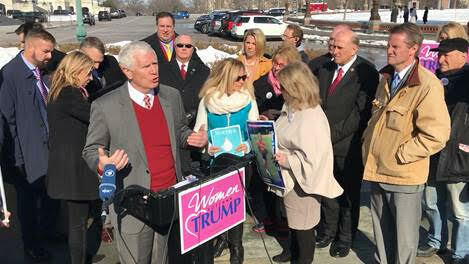 Tuesday, Congressman Mo Brooks (AL-5) supported and spoke at an “Angel Moms” news conference on the U.S. Capitol grounds on behalf of Americans who have lost family members because of illegal alien crime as a result of America’s “porous” southern border. During the event, Angel Moms and their family members shared their grief for loved ones who lost their lives at the hands of illegal aliens or because of holes in America’s border security. This came the same day that Brooks delivered a passionate speech on the House floor describing the lives and deaths of people killed on American soil by illegal aliens, including multiple incidents tied to Alabama. The congressman also challenged Democrats in Congress to help protect American lives. Mr. Speaker, in 2018, more than 2,000 illegal aliens were apprehended by federal law enforcement officers for homicides committed on American soil. That is roughly 2,000 dead in just one year! And that does not count some number of the 70,000 Americans whose lives are snuffed out each year by poisonous drugs, much of which is shipped illegally into America across our porous southern border! Americans would know about these horrific killings if the media diverted just a fraction of the time it spends on extoling illegal aliens and attacking our brave border patrol and ICE officers and agents to telling the stories of American lives needlessly ended by illegal aliens. Today I share a few stories about those who died solely because of illegal aliens and our porous southern border. Louise Sollowin was a beloved mother, wife, and grandmother. Louise spent 50 years helping her sister fire up the oven at Omaha, Nebraska’s Orsi’s Italian Bakery, where she worked well into her 80s. In 2013, after 93 years of life, Louise was brutally raped and beaten to death by an illegal alien. To make matters even more horrific, Louise’s daughter found her bleeding, battered and dying mother with a naked illegal alien passed out on top of her. In 2010 in Houston, Texas, 14-year-old Shatavia Anderson, was shot in the chest and killed by two illegal aliens. Shatavia loved her family and loved talking on the phone. She proclaimed that one day she was “gonna be somebody.” Shatavia was robbed of that dream by illegal aliens. I have a Washington staff member, Michaila Lindow, who well-remembers being baby-sat as a young child by family friend Tad Mattle. In 2009 in Huntsville, Alabama, then 19-year-old Tad Mattle was driving home with his girlfriend from a church social. While stopped at a red light, an illegal alien who was fleeing the scene of yet another crime, and whose blood alcohol content was three times the legal limit, rear-ended Tad Mattle’s car. This illegal alien had three prior DUIs. Tad Mattle’s car exploded on impact, tragically killing Tad Mattle and his girlfriend. Tad, the oldest of 3 children, enjoyed making music and served as percussion leader in the Grissom High School Marching Band. Three days before he was killed, Tad was awarded a full scholarship to the University of Alabama in Huntsville, where he planned to pursue an engineering degree. Mr. Speaker, each of these horrific deaths have one thing in common. None of these lives would have been stolen from us but for illegal aliens aided and abetted by Democrats who protect, promote and prefer the lives of illegal aliens to the lives of American citizens. Mr. Speaker, these killings on American soil will continue if America does not secure our porous southern border. As for those who support amnesty and open borders: how many American lives and dreams must be snuffed out by illegal aliens before Washington has the guts and integrity to secure our porous southern border? How many dead Americans does it take before you will start saving lives rather than aiding and abetting those illegal aliens who take them? Brooks was joined at the press conference by fellow Republican Congressmen Louie Gohmert (TX-01), Matt Gaetz (FL-01), Chip Roy (TX-21), Andy Biggs (AZ-05), Jody Hice (GA-10) and Scott Perry (PA-10), along with retired Immigration and Customs Enforcement (ICE) Director Tom Homan.